Bliss indeed! This elegant floral arrangement works design magic, weaving a beguiling tapestry of colors. Who wouldnt love this stunning gift? 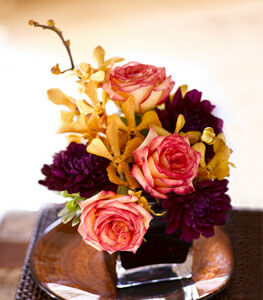 A plum-colored glass cube vase, filled with burgundy dahlias, yellow roses, and yellow dendrobium orchids. Sounds great! You guys are way better than 1800flowers.com! Thanks again!